Indoor plants are becoming essential décor items these days. It is not only a fashion trend but also helps make our environment bearable. Indoor Air Pollution is very real. Sometimes the air that we breathe inside our comfortable homes is more harmful than the air outside. Every living being on this planet needs plants in some way or the other. Through photosynthesis, they convert carbon dioxide and produce fresh oxygen that rids the air that we breathe of its deadly toxins. Since we stay inside most of our time, healthy air quality should be our only priority. The following article will help you discover 3 kinds of (easy-to-maintain) indoor plants that improve indoor air quality. Scientists have observed that the Areca Palm removes more toluene and xylene (mostly found in household products such as glues and adhesives, fingernail polishes and paints) than any other plant. 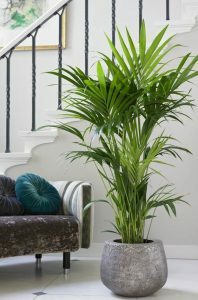 Areca Palm, also known as the Butterfly Palm is an upright houseplant, vase-shaped with delicate but fast-growing fronds. It has the capacity to remove most toxins from the indoor air. Areca Palm prefers a humid environment as it emits a large amount of water vapor which is a blessing for dry indoors. 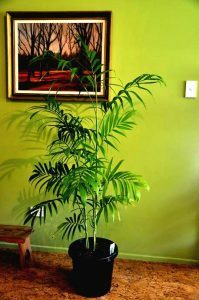 The plant can reach up to 10 to 12 foot in height, hence, when selecting an areca palm look for the larger trunks at the base of the plant. Make sure that the plant has a loam-based potting soil and is fertilized on a regular basis. Another plant that you can keep indoors is the Bamboo Palm. It has the ability to remove formaldehyde from the air. It is also effective in removing benzene which is an ingredient used to make detergents, rubbers, and dyes. The plant adds humidity to any room with its lacy green fans born on the clusters of slender canes giving a tropical feeling. Also called the Reed Palm, it prefers bright indirect light and a temperature between 16-24 degrees Celsius. A southeast window or door in a warm part of the house is the perfect spot to place the plant. If you see some of the interior foliage getting off, don’t worry! The plant is adjusting to the indoor setting. Remove the dead fronds without pinching out the tip of the new stalks of the plant. Water the plant just enough to keep the roots moist. 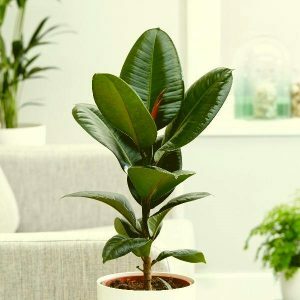 Another houseplant which is a great option to remove the harmful toxins from the indoor air is the Rubber Plant. Quite famous in the Victorian era, the Rubber plant grows well inside the house with a temperature as low as 5 degrees Celsius. It prefers semi-sunlight but dim lights are also tolerable for them. Hence, it becomes extremely easy to place them in indoor conditions. However, it is advised to avoid them from direct sunlight, especially in the summers. Do watch out for the scale insects which are extremely attractive to the rubber plants. Also, water the plant regularly for a long life. Although it has not been proven that indoor plants have eliminated all the deadly air pollutants that are found in a household, but they most definitely improve the level of indoor air quality. Which also helps in improving our health and productivity. After a lot of observation, botanists have come to the conclusion that houseplants are a natural air purifier and are highly effective. The rise in bad air quality has put us in a place where we need to re-evaluate the number of plants that we might need to clean the toxins present in our room. Children and adults are constantly facing the danger of air pollution. It is about time we start taking necessary measures to protect our loved ones. Did you find the article useful? What are your other favorite indoor plants, let us know in the comments section! Also Read: HOW EFFICIENT ARE PLANTS IN CURBING INDOOR AIR POLLUTION?